Do you love mountain biking…. in proper mountains? Do you want to switch off, head to the hills and stoke the very embers of your soul? 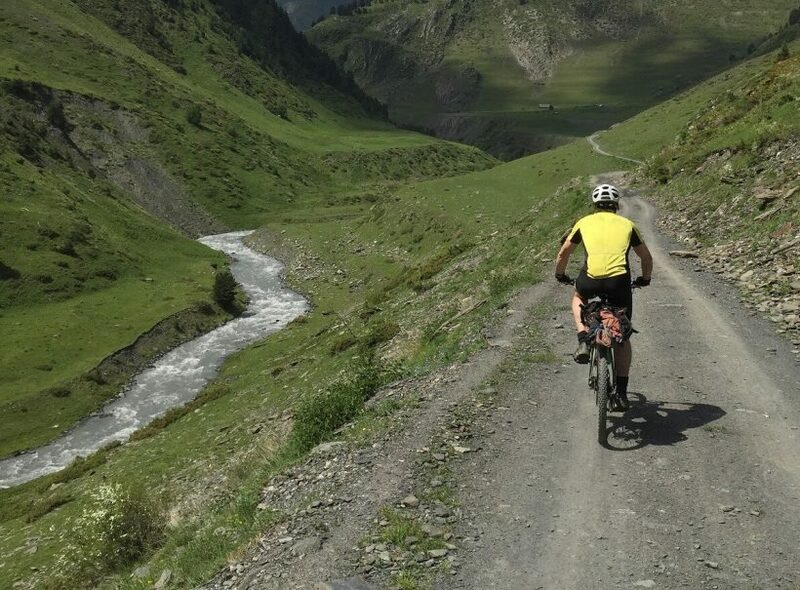 Then this pioneering MTB ride across the heart of Kyrgyzstan could be all your dreams come true. 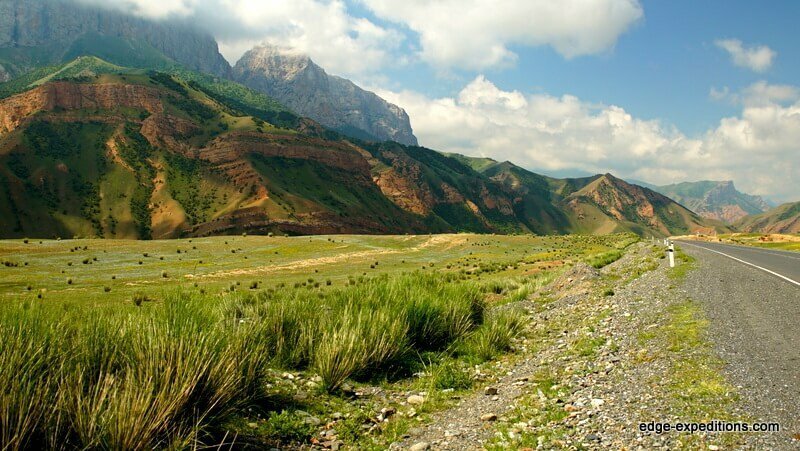 Mostly on tracks but with some sections of single trail, this is a superb way to experience the jaw-dropping landscapes of this mountainous Central Asian nation. 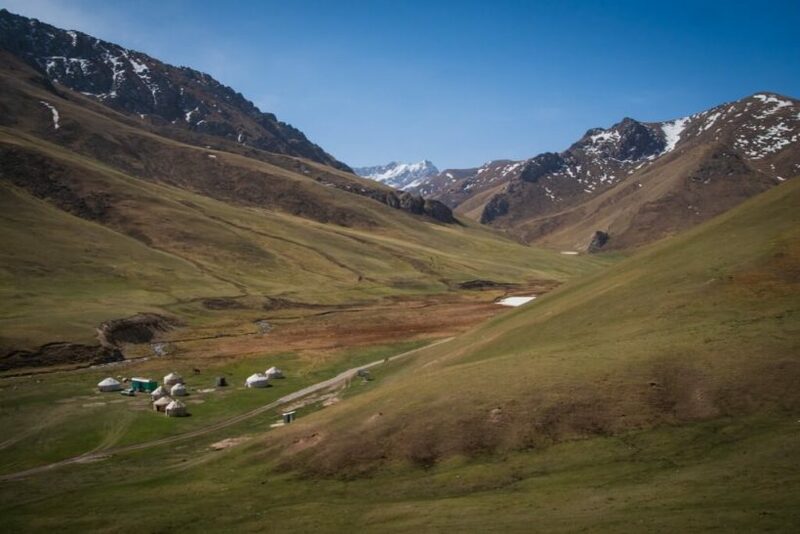 Having carefully studied the topography of central Kyrgyzstan, we’ve devised a spankingly good route that will be enjoyable, challenging and deeply rewarding to ride. With a cumulative vertical ascent of nearly the same height as Mount Kailash (6600 metres) and a descent equivalent to Mount Denali (6150 metres), there is plenty to get your teeth into! 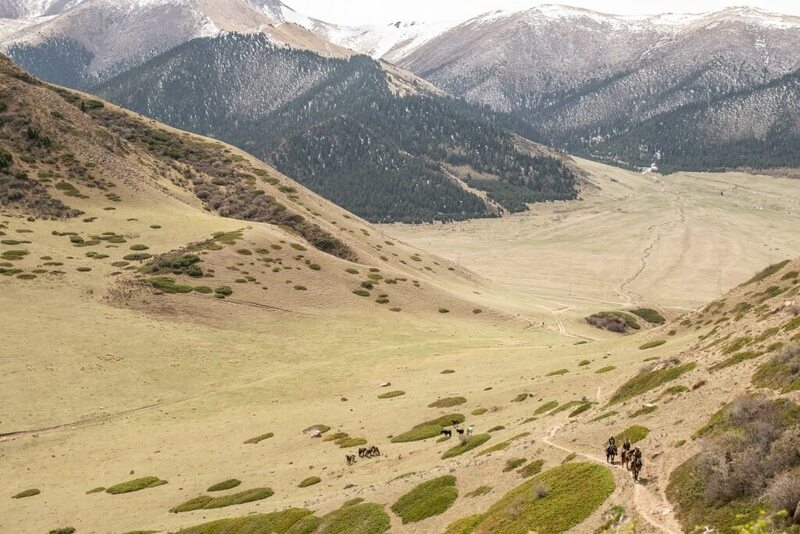 You’ll be pedalling up some serious ascents, whooping down epic descents and enjoying lashings of warm and welcoming Kyrgyz culture on the way. There’ll be rides over high passes, views to wet the tear ducts, cosy nights in yurts beside glistening alpine lakes and soul-charging glides along flower-filled valleys. So you can rest those weary legs, there’s a day off by a mountain lake where you’ll have the option to ride a horse, go for a walk or simply just relax. It is supposed to be a holiday after all…. This trip will be led by Dave Cowell, a highly experienced expedition leader, ski-tourer and mountain biker. There’s nothing this man doesn’t know about adventures and mountains! Starting and ending in the capital, Bishkek, you’ll be supported by a back-up vehicle that will carry your luggage and ample fresh water, allowing you to ride without hindrances. A massive injection of adventure in just two weeks away from work – think vast skies, massive mountains, soaring eagles and wide-open steppe. 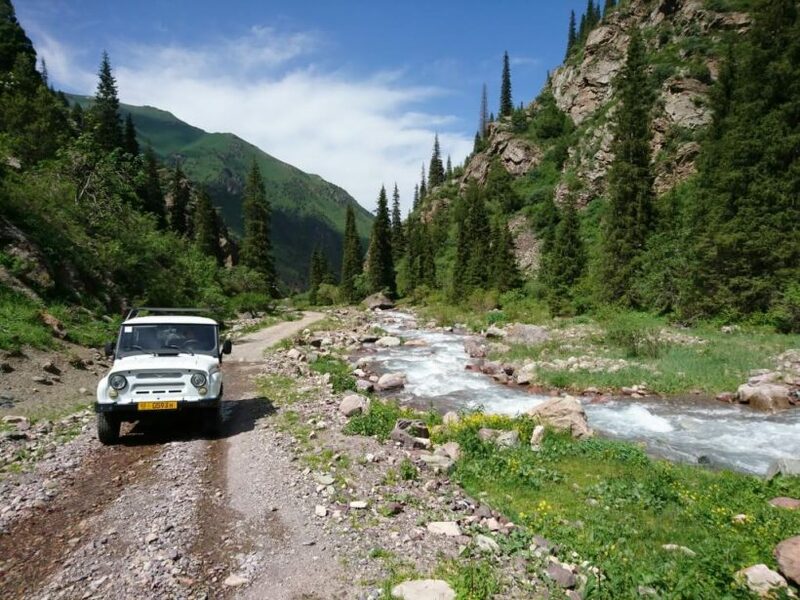 We’ll be there to collet you on arrival at Bishkek Airport and will whisk you off for a day of acclimatisation before we head into the hills to begin our trip. 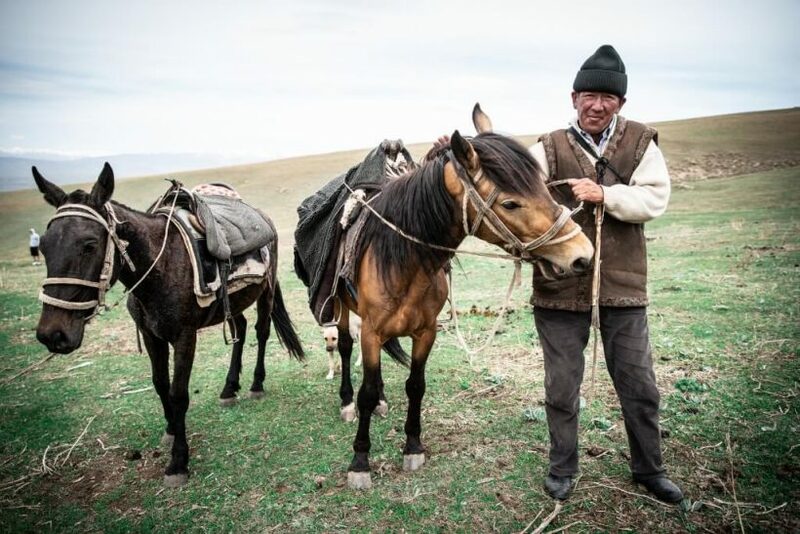 You’ll have an experienced British tour leader who’ll work closely with our Kyrgyz team. It’s going to be an unforgettable trip. A fixed-date itinerary with a minimum of 6 persons and maximum of 9 persons. 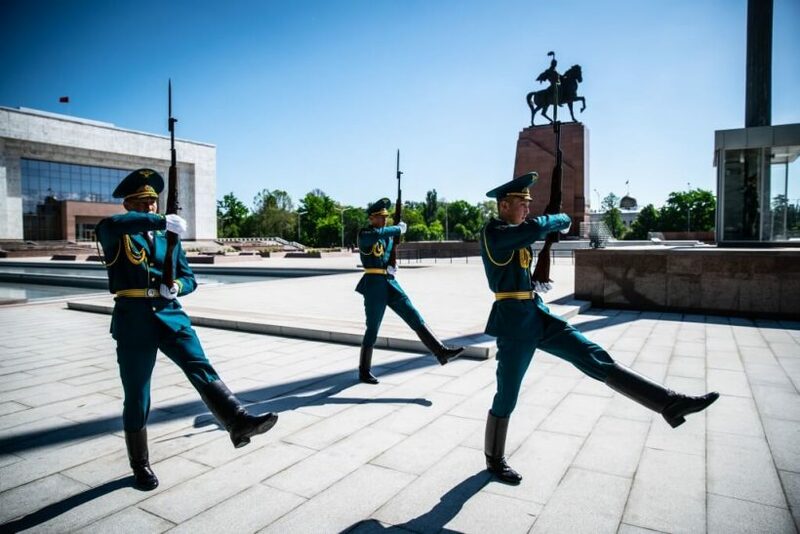 Arrive in Bishkek, the capital of Kyrgyzstan, and – depending what time your flights arrive – have the remainder of day off to rest and explore the city at your leisure. Into the cars after a hearty breakfast and up into the hills towards our home for the night. You can make your final preparations for the ride at our yurt camp under the stars at around 2100 metres above sea level. Into the saddle! A 6 km ride with 900 metres ascent and 140 metres descent. We’ll enjoy panoramic views of the Suusamyr Too range and its eponymous valley. Plenty to get the lungs working today but more down than up on our 80 km ride. You can expect 650 metres of ascent and 1450 descent, with a possible river crossing or two thrown in for good measure. Today begins with a fairly decent pass to cross at Kyzart. We’ve just 46 km to cover but within it we’ll ascend 1240 metres and descend 460 metres. This effort will be rewarded by arriving at Son Kul, a delightful high-altitude alpine lake on the shores of which are several yurt camps – one of which is our home for the night. Rest easy and enjoy a beer tonight for tomorrow is our rest day. Today is a designated day of rest for your muscles. For those wanting more of a work-out, we can offer a horse ride around the high plateau, a hike in the surrounding mountains or you can always hop into the saddle to explore on your bike alone if that is more your thing. We will ensure that there are some cold beers and – a staple for Silk Road Adventures – gin and tonic available for those looking to relax with a book. Ok, that’s enough resting. Back into the saddle today! But it is just under 70 km and within that short distance we will ascend only 320 metres, but descend 1790 metres. Cue some fast carving and whoops of joy! We’ll end today in the regional town of Naryn, and a little guesthouse there with views of the rolling hills. We have 600 metres to climb today, with very little descent in the 60-odd km we will travel. We are swapping ranges today, as we move from gentle Moldo-Too range into the much larger Teskey Alatoo, part of the Tien Shan proper. We’ll spend out evening under the stars again at an altitude of around 2800 metres in the Ek Naryn valley. As you can tell from the names involved in today’s route, we climb towards the mightly Tosor Pass. Another roughly 60 km day with 800 metres climbing towards the camp. Hopefully we’ll have clear skies and wonderful star views tonight, our last out in the wilds. Here’s the big one. We go up and over the 3900 metre Tosor Pass this morning, a stiff climb of 550 metres. Your lungs are going to be busting by the top, but there are just rewards awaiting you in the shape of a 2300 metre descent to the town of Tosor, the place where you’ll end your riding by the shores of Issyk Kul lake. We’ll then transfer along the lake to a delightful yurt camp (single occupation yurts if we can manage it!). This will be an evening of celebration and relaxation. We have hired a mobile sauna, converted from a 1970’s GAZ Soviet truck, which will reverse down to the very edge of the water. The water is crystal clear and it’ll be a special evening. We’ll have a leisurely start today on our 4.5 hour drive back to Bishkek and will stop on the way at the Burana Tower – a minaret that was part of the once great Kakhanid dynasty from the 9th Century. There are also places to stop and buy some delicious Kyrgyz honey on the way to Bishkek. Tonight we are at a comfortable hotel in the city centre and we’ll all go out for a slap-up meal and some drinks to celebrate the trip. We will get you to the airport in good time for your flight home today. 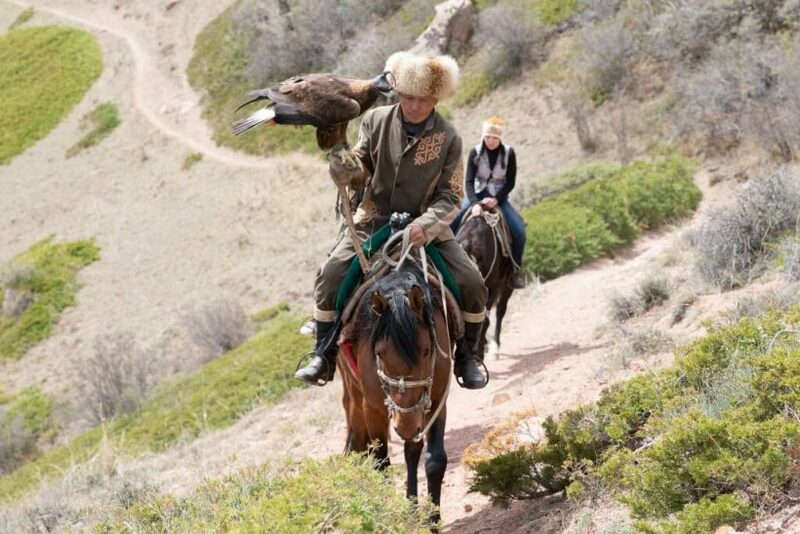 You’ll fly away with wonderful memories of Kyrgyzstan and its people. 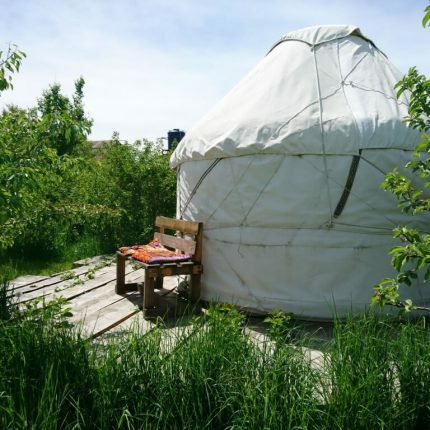 We’ll be staying in a mix of places – from four star hotels in Bishkek, to wonderful, family-run yurt camps in the wilds of Kyrgyzstan. You won’t always have access to hot showers, but the wilderness and views will more than make up for it. Our group sizes are always small, allowing for an intimate experience of the cultures we meet along our path. On this trip we won’t have more than nine guests, plus our UK guide and the local guide, plus our drivers. We usually find groups are made of like-minded people, both male and female, from a wide age range. Dave has had a lifelong passion for adventure in the mountains and started rock-climbing as a teenager in the 1980s. The obsession grew unchecked into all branches of climbing and mountaineering. After attempting to make the first high-level crossing of the island of Spitsbergen with a friend, sponsored by Newcastle Brown Ale, he set about exploring other far-flung places – including Pakistan, India, Tajikistan, Turkey, Albania, Montenegro, Slovenia, Spain and many more traditional destinations. He has devised, organised and led a huge number of trips and expeditions. In his spare time he has had careers as an environmental scientist and software engineer, and in 2012 he founded FATMAP, the world’s first dedicated global outdoor map platform. He enjoys mountain-biking, bouldering, rock-climbing and skiiing. He lives with his wife Ros and their two children in Bristol, UK. How is this different to other MTB expeditions I’ve seen? 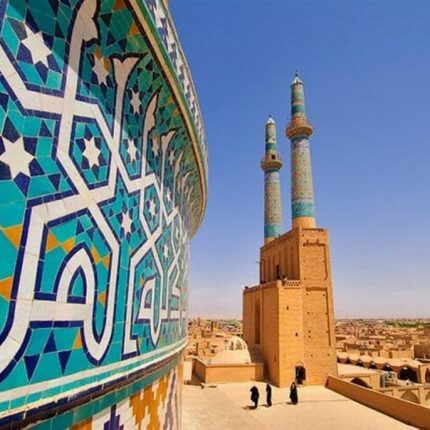 We have been living, breathing, reading, researching and travelling the Silk Road for the past five years. We have researched the route in detail – climbs, descents, gradients etc. You’ll be able to sit back and relax (well, not exactly relax on the ascents…) in the full knowledge that we’ve got the logistics covered. You’ll also be led by an extremely experienced UK guide, a man who knows these mountains well. It’s mid-summer, when Central Asia can be very hot in places, but we are spending much of our time up in the mountains. 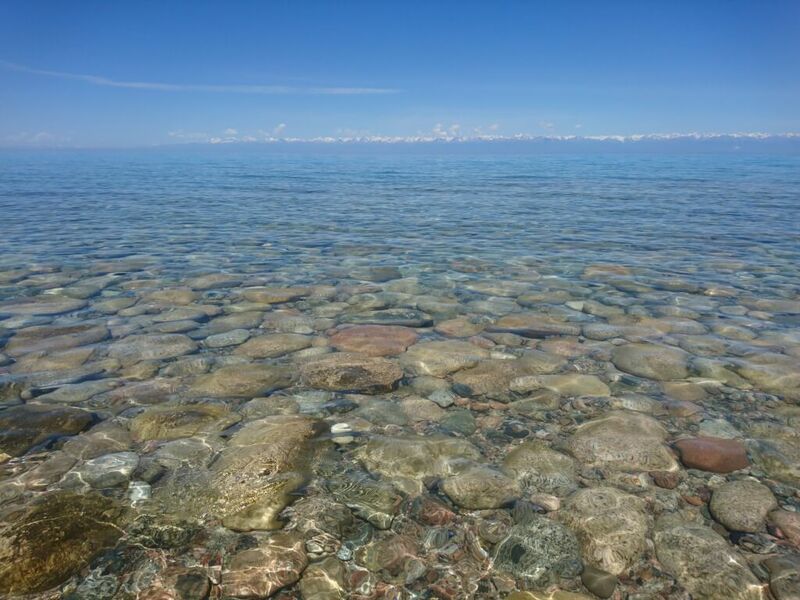 Expect up to 30 degrees in Bishkek but around the 20’s in the hills and by lake Issyk Kul. It could get down to around ten degrees at night in the mountains of Kyrgyzstan. But have no fear, we will supply you with a detailed packing list after you’ve signed up. Yes. More than 85% of our expedition clients travel alone as part of our group. We don’t charge single supplements to solo travellers – see below. Very rarely, and not on this trip. We don’t believe that solo travellers should be penalised with extra charges. It goes against our ethos, so unless totally unavoidable or astronomically expensive, all costs are included in the expedition price. 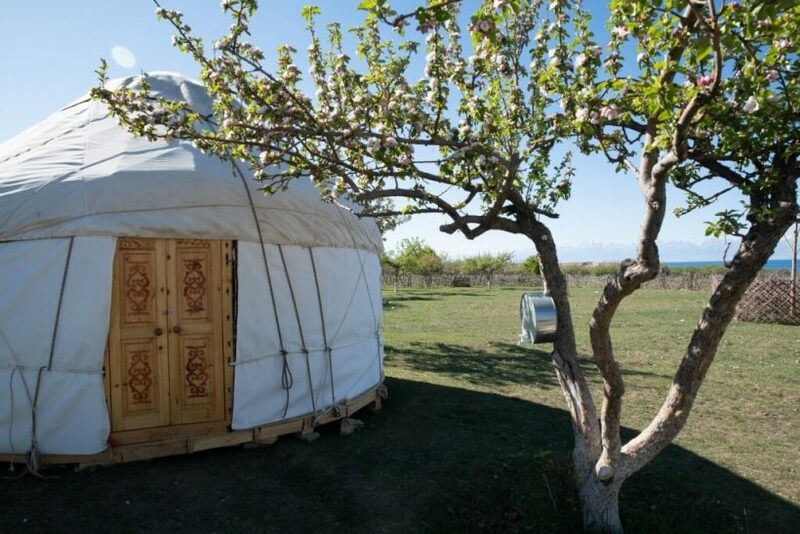 Please note that in most of the yurt camps we are staying in, single rooms are simply not available. Yes. Several. We will travel with enough space in the cars for people and bikes, for any transfers we need to do. We will mostly be supported by the bike car at all times (for emergencies and any mechanical issues with your bike) but there will be some times when it can’t follow us, so will meet us again at the next suitable point. The back-up vehicle will also carry filtered water top-ups. This is a moving feast! It depends on where you are travelling from and how you want to get there. From London, it’s around £350-400 return to Bishkek. We can offer flight inclusive packages also though, so just let us know if you’d like us to handle your booking. Again, we’ll send you an information pack containing all the information you need when you book your place. Varied – the ‘stans are a region known for meaty delicacies so you can expect tasty shashlik almost anywhere if this is your thing. But it’s not all bad news for veggies as the salads in Central Asia are fantastic. Bread, plov, tomatoes, cucumbers, dill and vodka all feature heavily! Yes, at times. There will be hotels and guest houses where we will have separate rooms and wherever possible we will arrange this, but there will also be times where we are staying in yurts when there is scant option but to share rooms. This is all part of the adventure, and a reason we love to travel here. It makes sense for light sleepers to bring earplugs, in case of snorers. Quite fit. 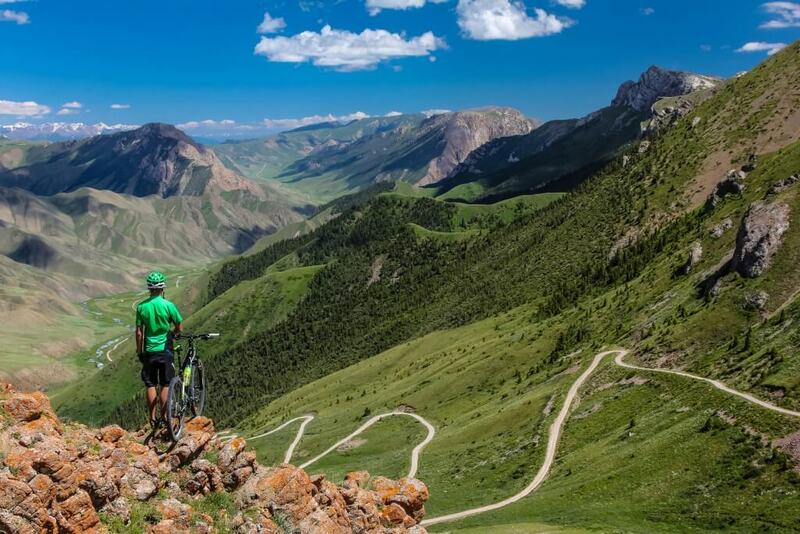 This is a cycling holiday in the mountains of Kyrgyzstan. That will tell you much of what you need to know. Will I be affected by altitude? Altitude can affect different people in different ways. It can also affect the same person in different ways from trip to trip. We will be spending a bit of time above 3000 metres in Kyrgyzstan, with a maximum altitude of 3900 metres. If you feel that you might suffer from altitude sickness, or have history of it, you should consider discussing this with your doctor prior to booking and travel. Diamox and other similar prescription drugs are available to ease symptoms, but the key way to address any onset of altitude sickness is to descend. Luckily, from anywhere particularly high, descent is possible rapidly thanks to our vehicles. Simple precautions and awareness go a long way.Our route is designed with safe altitude gain in mind. Yes. We offer set group dates for some of our expeditions, but we can organise and deliver bespoke expeditions to groups and individuals to suit your itinerary and budget. More information is available on our Tailor Made tours page. As with any new, pioneering itinerary we need to reach a minimum number of guests to make this viable. For this trip, we need a minimum of 6 guests from the maximum 9. When you express interest in this expedition, we will send you a deposit invoice to hold your place. This is refundable according to our terms and conditions if we do not reach the minimum numbers. We recommend that you do not book your flights or other arrangements until we have communicated that the expedition is definitely departing as planned and will aim to do this in order to give you at least 3 months prior to the scheduled departure in which to make your travel arrangements. If you love adventure, new places, friendly people, wild landscapes, history and culture then yes! However, if you’re the sort of person who is going to be worried about the lack of flush loos in a mountain yurt camp, might complain that the road to Bokonbaev is too bumpy or frets about Wi-Fi availability, then this probably isn’t your bag. 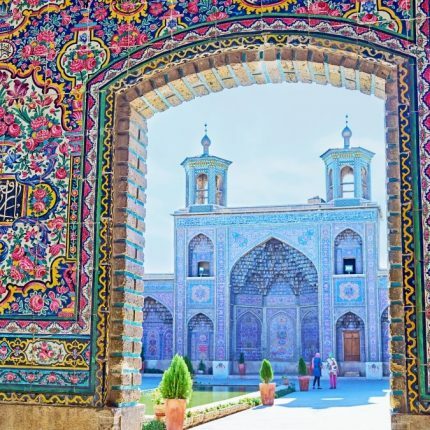 A wonderful slice of Classic Silk Road Iran – bustling bazaars, silent deserts, starry skies, iconic Silk Road cities and so much more. Bring an open mind and an empty memory card.